Independent studies confirm valuable cost-savings from regularly performed wrought iron maintenance. Your property’s rails and fencing are always under attack from landscaping moisture & coastal sea salts. These corrosive forces are catalysts accelerating the deterioration (and subsequent failure) of the wrought iron. The Carasso restoration pros repair the broken gate closures and latches, plus replace any deteriorated bottom rails, pickets or support posts. After the repairs (along with meticulous surface preparation), special primer & paint work together to form a new, protective seal around the metal… and voilà! Beautiful, stately & protected wrought iron. Let’s save some moola. 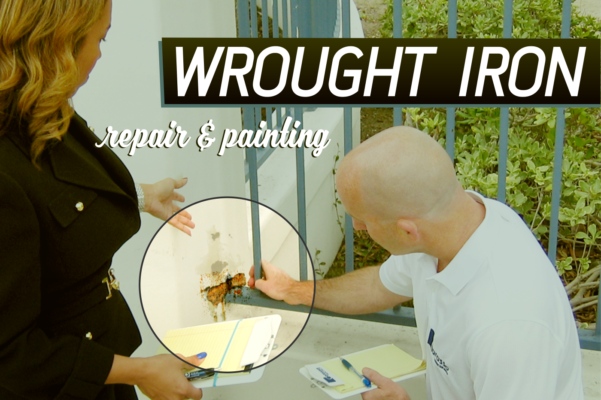 Contact Bill or Dave today to schedule your community’s wrought iron repair & painting maintenance. "not a good job but ..."
"I just felt compelled to let you know how much I love your entire crew! Everyone is professional, knowledgeable, talented, friendly takes pride in their work, and is committed to doing, not a good job but, a great one!"